All eight Night Force vehicles (five from 1988 and three from 1989) were repaints. The Night Blaster is a repaint of the 1987 Maggot. 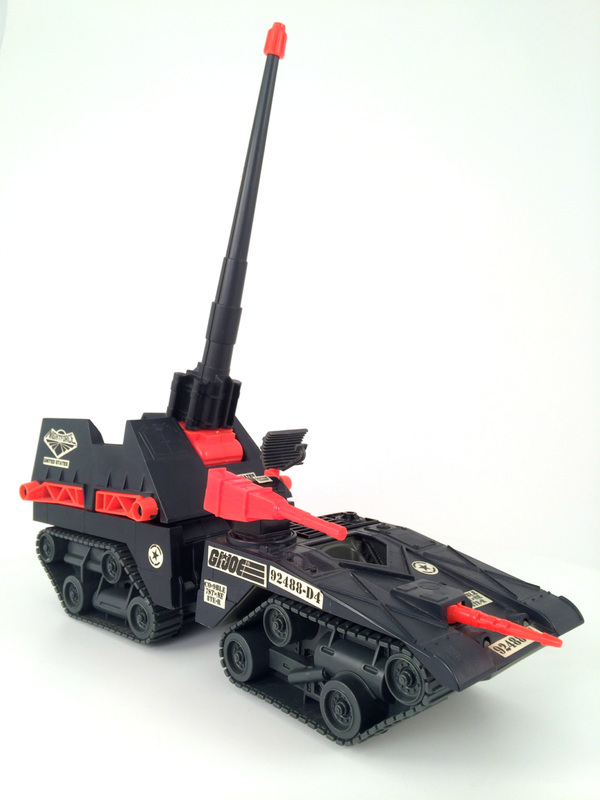 Night Blaster courtesy of Dan Carroll. Check out his eBay store for tons of vintage Joes! The Night Blaster breaks into an armored reconnaissance vehicle, a long-range gun emplacement, and a high speed attack vehicle. 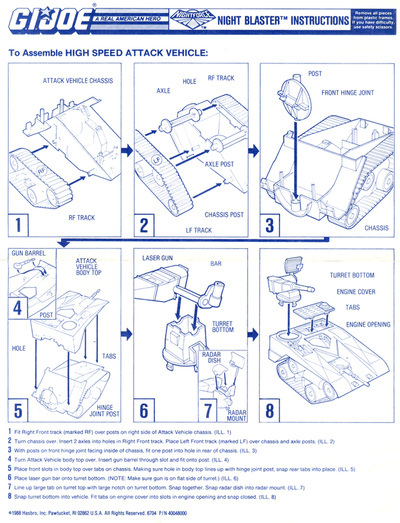 The armored reconnaissance vehicle (ARV) has beautifully detailed monitors and mechanics. 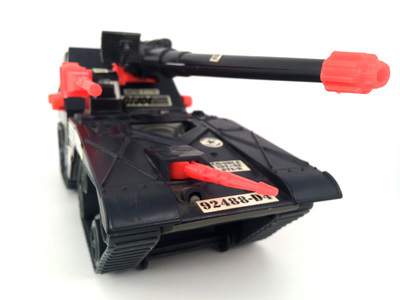 The “Silent Speed” separating armor anti-tank vehicle (ATV) features a swiveling radar and removable engine cover. 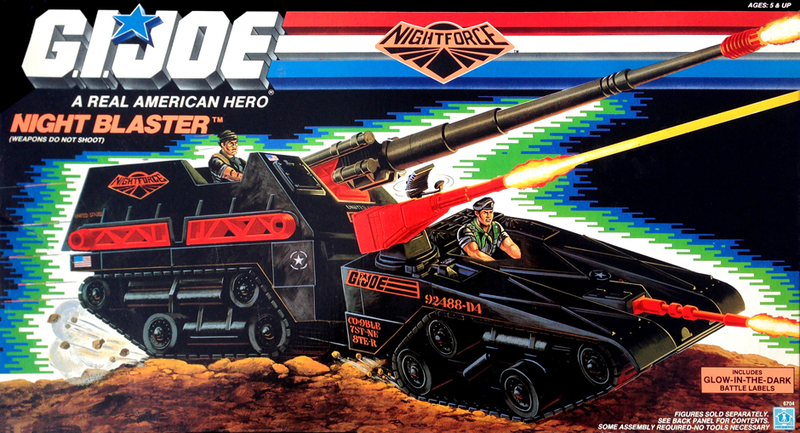 NOTE: Although the box art showed Lt. Falcon and Tunnel Rat manning the Night Blaster, no figures were included. Night Blaster box photos courtesy of Page and Greg Wagner. Check out their eBay store for tons of vintage Joes! 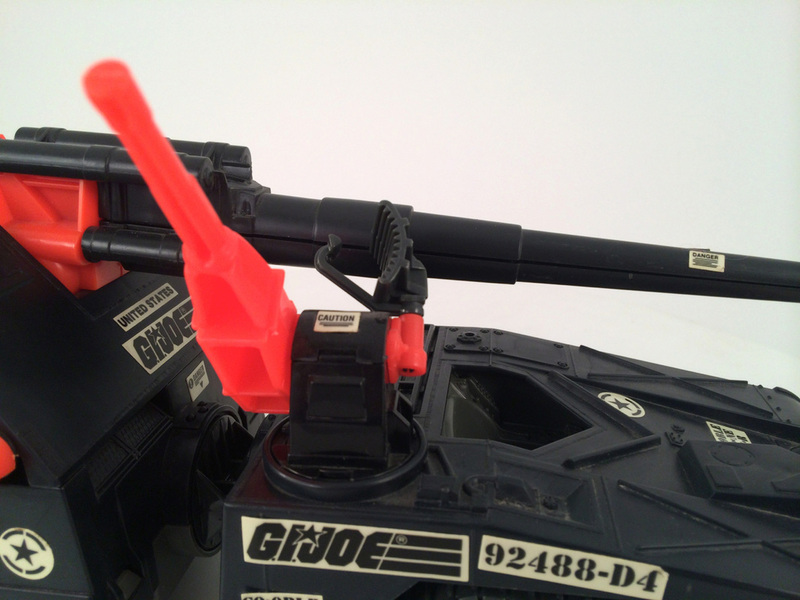 The Night Blaster features several moving parts and removable parts, and the sculpt is incredibly detailed. 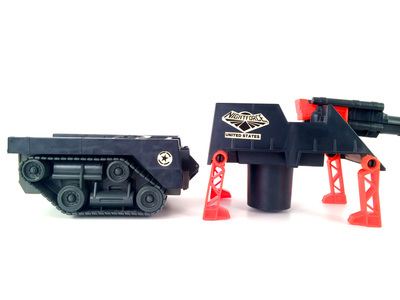 All eight Night Force vehicles (five from 1988 and three from 1989) were repaints. 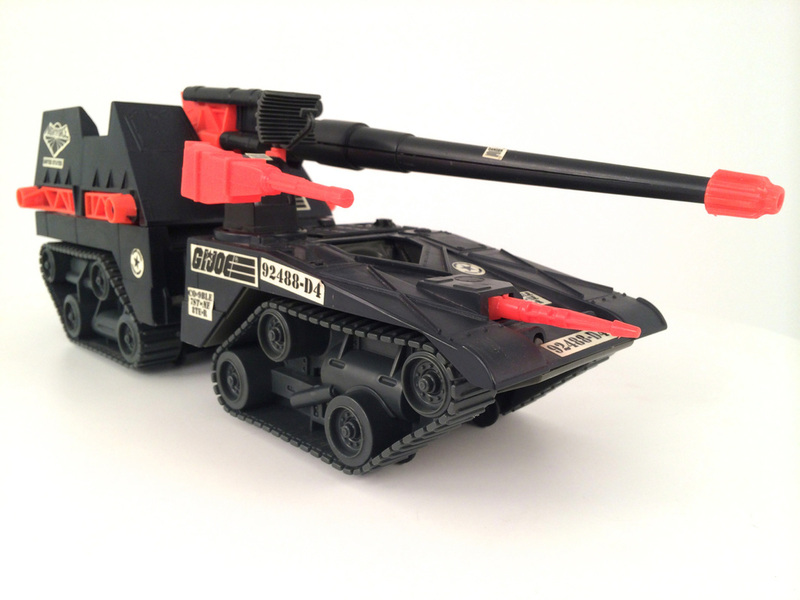 The Night Blaster is a repaint of the 1987 Cobra Maggot. 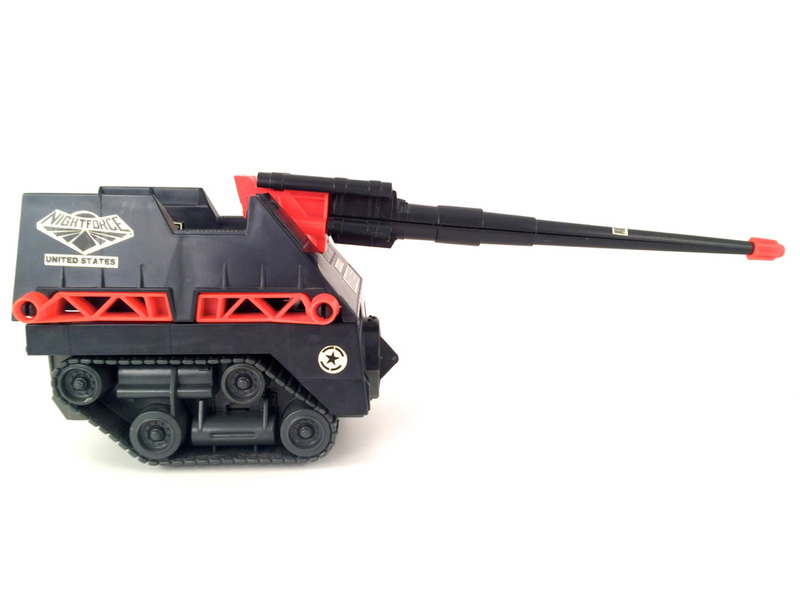 The Night Blaster's main armament is the “RAP” (rocket assisted projectile) long range 155mm cannon. 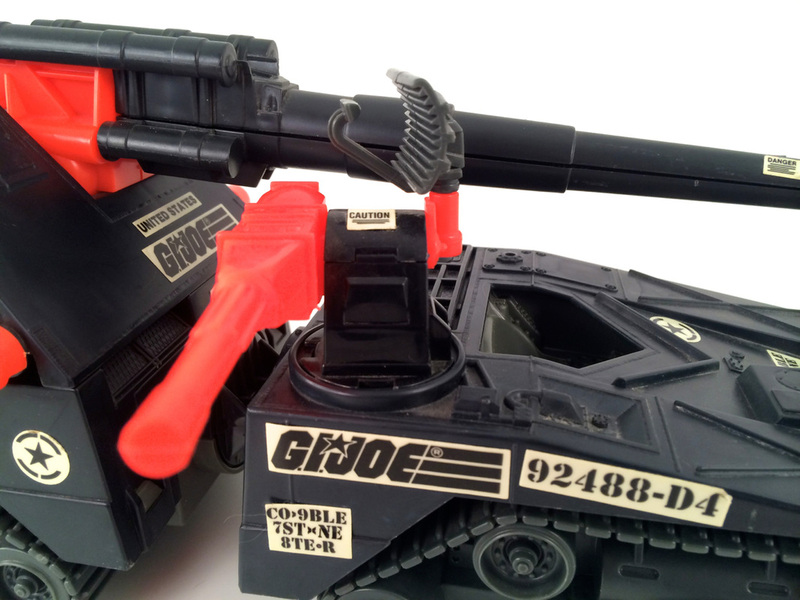 This cannon raises almost 90 degrees. The Night Blaster's “RAP” long range 155mm cannon features a “Quiet Shot” ultra noise-dampening muzzle. The front of the “Silent Speed” separating armor anti-tank vehicle (ATV) features a rotating driver-operated 240RPM 40mm cannon. 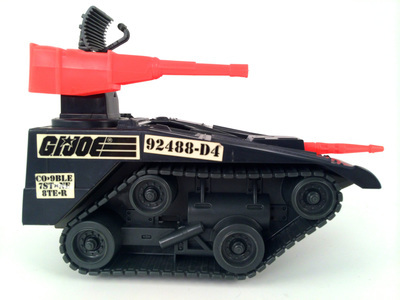 The rear of the ATV features a "Night Vision” MAG-61V radar mounted on a “Heater” (high efficiency anti-tank energy reactor) laser. The "Night Vision” radar and the “Heater” (high efficiency anti-tank energy reactor) laser both swivel independently. The “Heater” (high efficiency anti-tank energy reactor) laser also tilts. 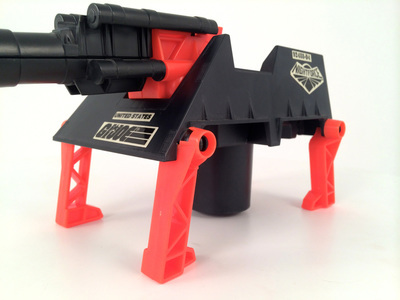 The Night Blaster breaks into three parts. 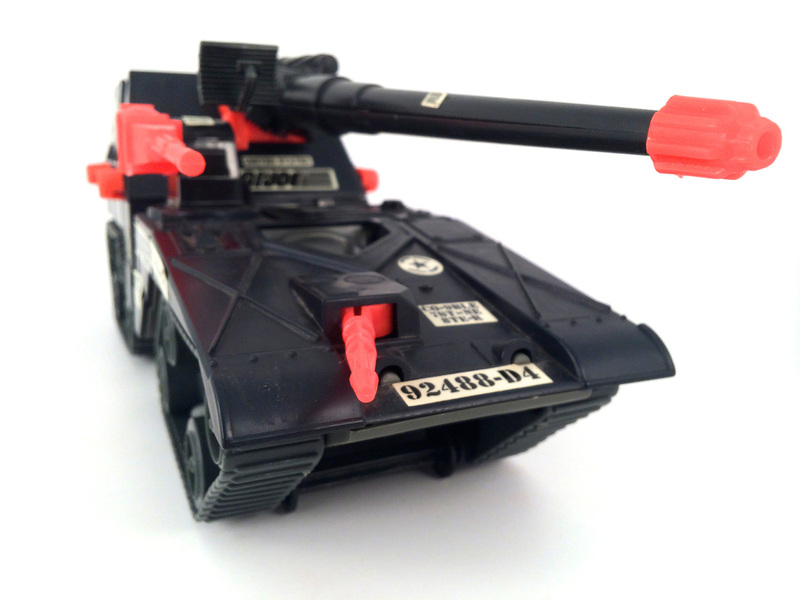 Here you see the “Silent Speed” armor anti-tank vehicle (ATV). 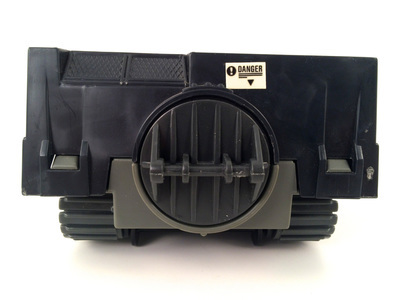 The “Silent Speed” separating armor anti-tank vehicle (ATV) features a removable engine cover. Remove the engine cover to inspect the super quiet “no noise” 1,000HP double muffler diesel engine. The Night Blaster breaks into three parts. 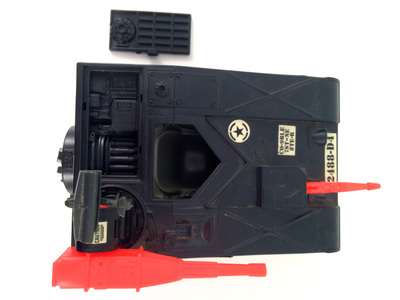 Here you see the the long-range gun emplacement still seated in the armored reconnaissance vehicle. 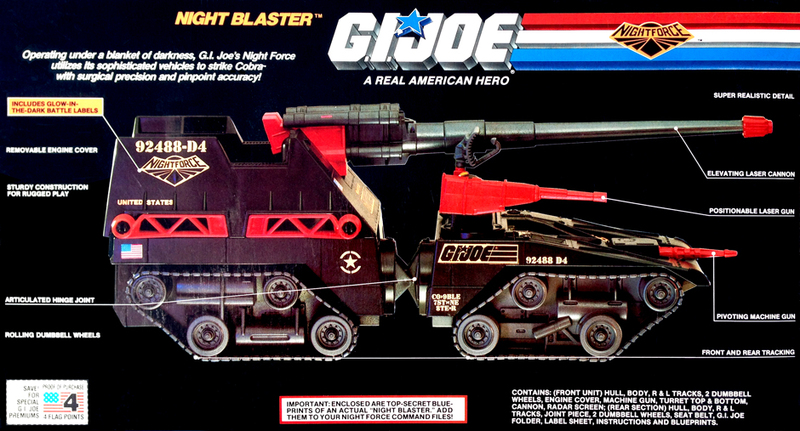 The Night Blaster breaks into three parts. Here you see the the long-range gun emplacement removed from the armored reconnaissance vehicle. 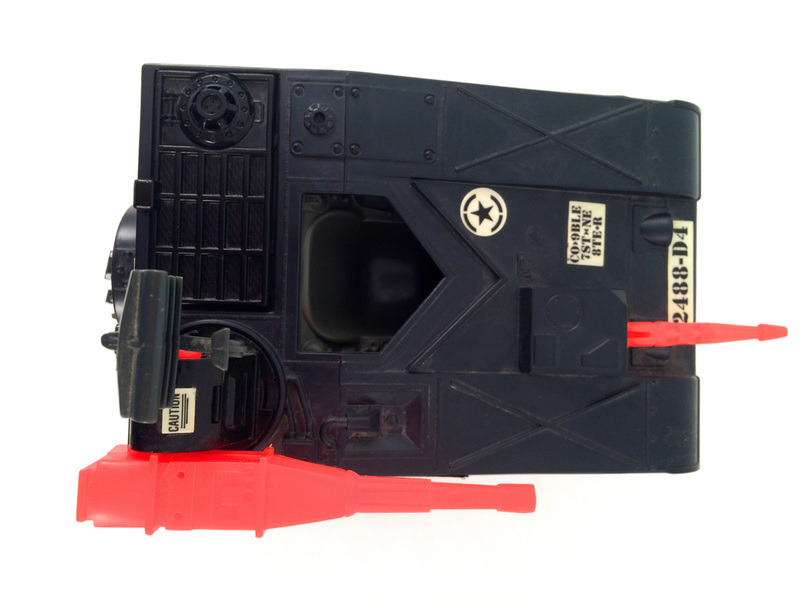 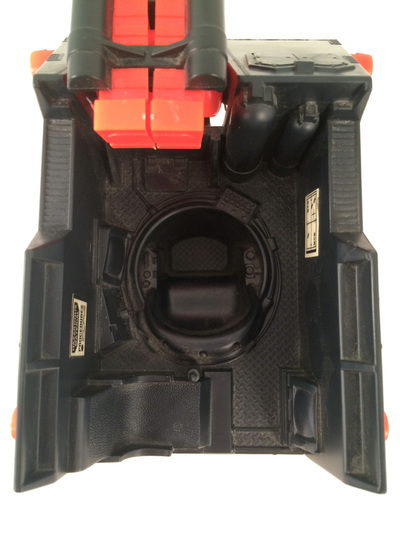 The long-range gun emplacement features hydropnuematic variable recoil cannon supports (legs). The long-range gun emplacement features a nicely detailed battlefield fire control station and armored command post. 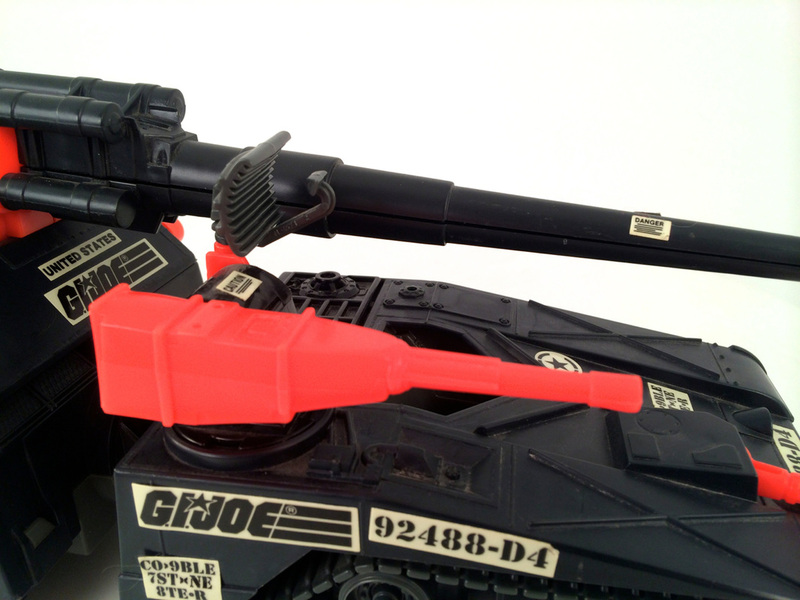 The armored reconnaissance vehicle (ARV) features a hydropnuematic articulation and separation joint. 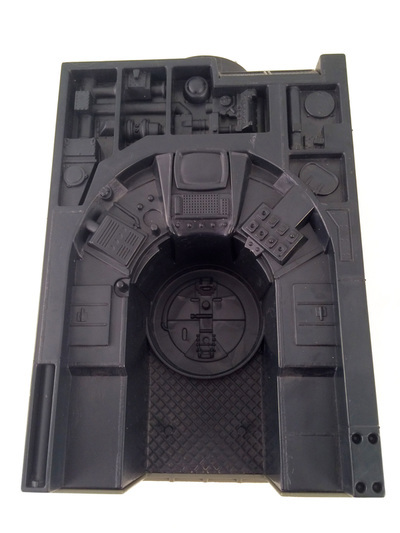 The armored reconnaissance vehicle's (ARV) control center is nicely detailed. 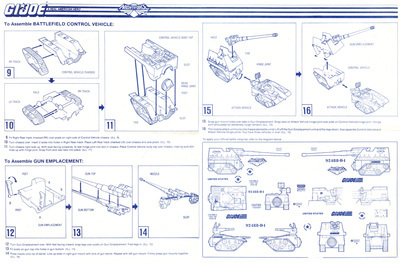 Instructions thumbnail images are below. 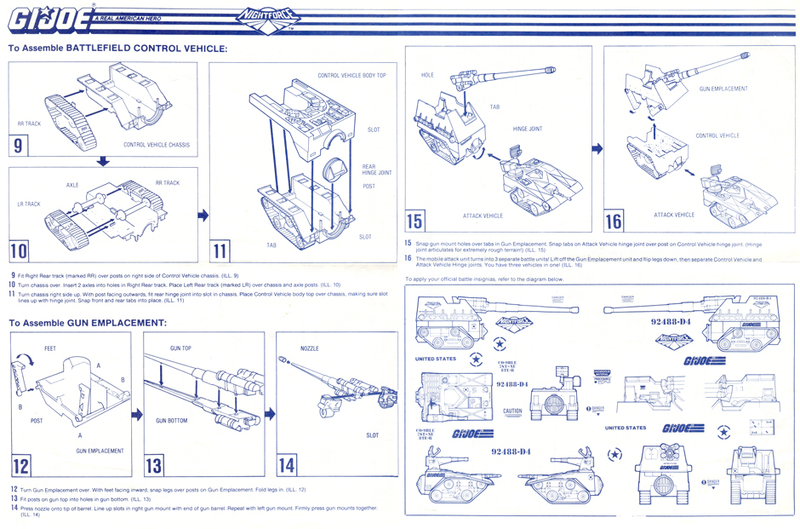 Click the thumbnails to enlarge them. 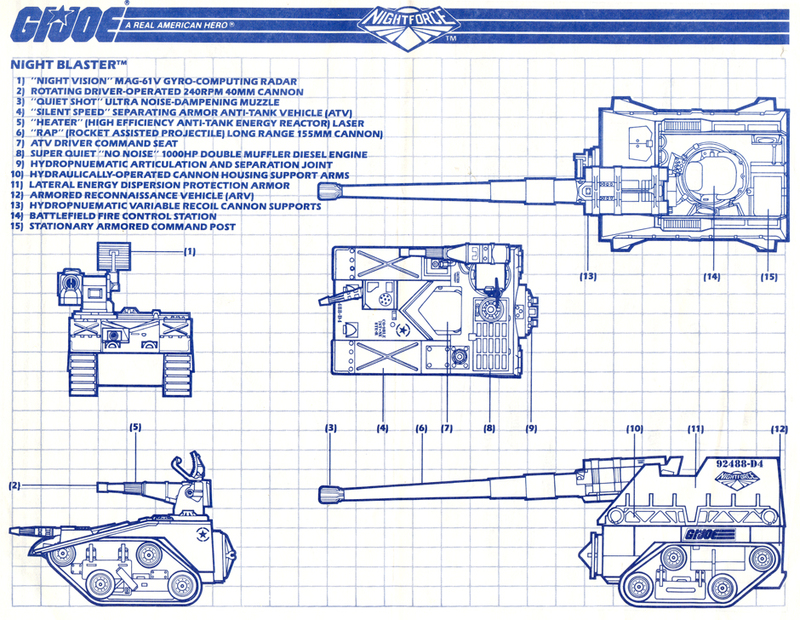 Night Blaster blueprint/instructions courtesy of Tim Dz.